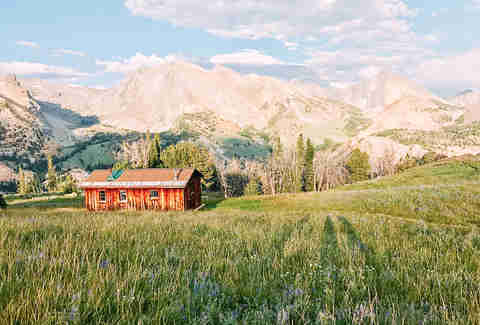 Sure, you’re here for the great outdoors, but Sun Valley is known for fostering artists, too. (*cough* Hemingway *cough*) There are several galleries to check out if your ski legs get sore. The contemporary Friesen Gallery has been in the heart of Ketchum for more than 30 years, while the Aurobora focuses on prints and fine art presses (it also offers workshops on weekends). Stone features even more untraditional mediums, with it’s art centered on semi-precious stones, fossils, and marble. (Plus, it’s headed by a local artisan.) If you want to take in some local art while enjoying the fresh mountain air, there’s plenty of street art to check out as well, from painted utility boxes on the sidewalks to giant sculptures. And if you want to pay homage to Papa, Sun Valley is the midpoint between his memorial and his grave at nearby Ketchum Cemetery. Shortly after becoming a ski destination, celebs like Clark Gable, Gary Cooper, and Ingrid Bergman started flocking to check out the slopes. They all stayed at one place: the Sun Valley Lodge. Their photos, plus plenty of other visiting (and resident) celebs line the walls. (Arnold Schwarzenegger, Clint Eastwood, Bruce Willis, and Bill Gates all have homes in the area.) While you’re keeping an eye out for current stars, enjoy the outdoor skating rink, hot pools, spa, and shopping on site. After hitting the slopes, there’s nothing like climbing into one of nature’s hot tubs, and Sun Valley has plenty of options. The springs you want for a warmer, less-crowded soak are the Sunbeam hot springs in nearby Stanley, ID, part of the Sawtooth National Recreation Area. There alongside the Salmon River lies a stretch of soaking opportunity that's quiet enough to make you fully appreciate the whole “communing with nature” idea. 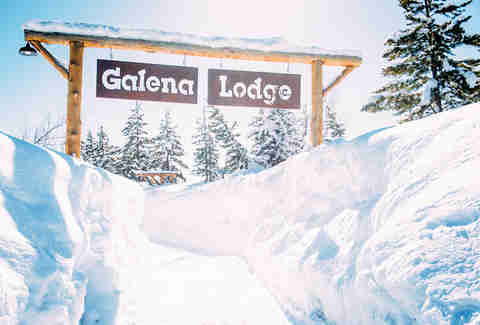 The Galena Lodge is an idyllic winter escape, with Nordic skiing, backcountry skiing, and snowshoeing. Best part? They rent out yurts with wood stoves to keep you nice and toasty on a chilly winter night. 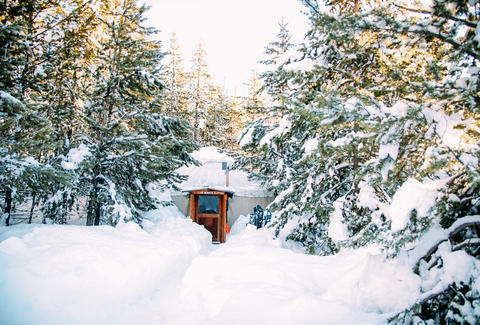 They’re only accessible by “human power” -- meaning you need to be able to ski or snowshoe your way to them, but the onsite sauna and remote locations are well worth the trek. Coyote Yurt offers similar accommodations, but is situated 8,700 feet high in the Smoky Mountains -- so it’s best for the views and more advanced skiers. 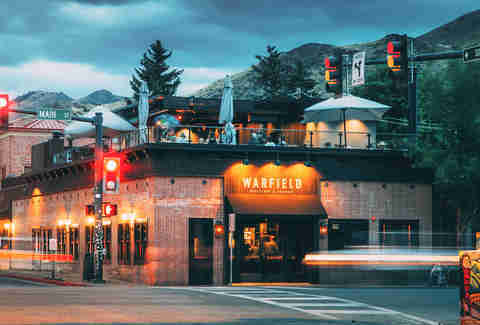 One of the best ways to get a feel for a town is to hang out at the local watering holes, and Sun Valley has plenty to keep your itinerary full after a day spent exploring. The guys behind Warfield Distillery & Brewery on the corner of Sun Valley and Main have created an upscale brew pub with its own stillhouse. (Their focus is vodka and gin, but whiskey is in the works.) Ask a local and they’ll tell you not to pass up a marg at the Pio (aka the Pioneer Saloon) which has been serving the community since the 1940s. Make sure you nosh on some classic Western fare while you’re there, too -- they age their own beef in-house. For the ultimate townie dive bar experience, though, head to The Casino -- allegedly Hemingway had a few here back in its heyday. Did you really go on vacation if you leave without a new favorite restaurant to miss? We think not. For casual fare, hit Grumpy’s after the slopes to try what locals call the best burger in town, plus schooners of beer and lots of eclectic knick-knacks on the walls for decor. To switch things up, though, you’ll need to place an order at Rickshaw, which offers Asian street food -- everything from Korean fried chicken to pho and Vietnamese caramel pork ribs. When you’re ready for something a bit more upscale, CK’s Real Food is the place to make a reservation. They specialize in local and regional ingredients in New American dishes, like their Lava Lack Rack of Lamb, served with an Idaho cannellini bean and kale ragout. Plus, they get a ton of their produce from their “back alley” farm and even make their own pickles in house. Ecological! 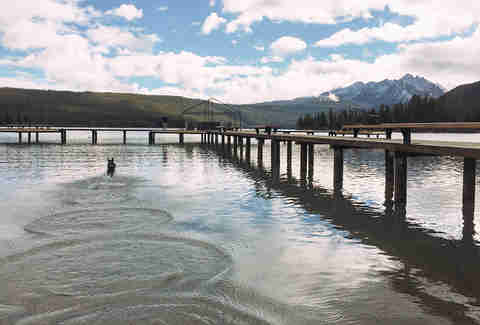 In nearby Stanley, Redfish Lake is about an hour’s drive into the heart of the Sawtooth Mountains and well worth the mini-road trip. Once there, you’ll find a super remote setting with crystal blue waters. While it's closed in winter, the dinner at the Redfish Lake Lodge in the warm seasons is the perfect closer to a day spent exploring. Or head there first thing to rent a pontoon boat for you and 13 of your closest friends. You can hike through the mountains too! When it’s not ski season in Sun Valley, it’s one of the most popular fly fishing destinations in the country. That’s because the fresh waterways in the area support about 4 million (yes, with an M) wild salmon and steelhead. At the Silver Creek Preserve, you’ll find huge brown trout -- plus it’s a wildlife refuge, so you’ll also get to check out 150 species of birds (including eagles and hawks) while you cast off. Big Wood River flows right through Ketchum, if you’re looking to stay local, but Salmon River is where Idaho’s salmon and steelhead call home after migrating from the Pacific Ocean. Sun Valley is home to dozens of events throughout the year, from its annual Sun Valley Writers’ Conference to Nordic skiing weekends, music festivals, and wine auctions. But, one of the most, erm...unique is their Trailing of the Sheep festival. Every October, they shut down the main arteries through town and let 1,500 sheep parade through the heart of Ketchum, as an homage to the town’s sheepherding roots. There’s plenty of food, sheep dogs(! 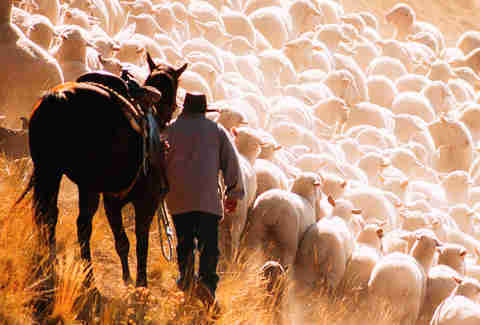 ), and even a “wool fest” that happens throughout the weekend. Remember that episode of It’s Always Sunny where “the gang” goes on a full ’80s ski trip? There are enough vintage stores in Sun Valley to totally recreate that vibe. 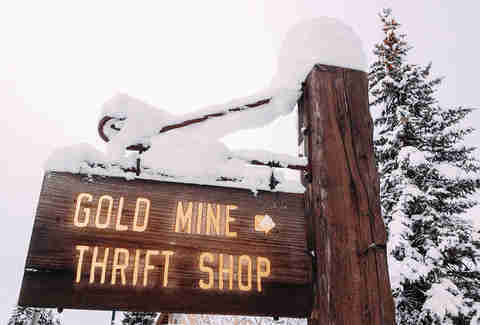 Gold Mine Thrift Store is one of the best options, where you and your friends will find Madonna-worthy one pieces to sport down the slopes for $10. Just make sure you avoid a gaper gap (when your ski goggles don’t meet your helmet) unless you want to let everyone know you’re from out of town. Other outlets include Deja Vu, which offers up vintage clothing, as well as Antique Alley for eclectic knick knacks and other unique finds. Last, at Maude’s Coffee & Clothes you can peruse the racks while you sip your morning cappuccino. Once you've enjoyed Maude's, you've got even more coffee options to explore. Whether you’re kick starting your day on the slopes or warming up after, Java on Fourth offers speciality coffees and espresso drinks that will do the trick. Go for the “Bowl of Soul” -- a mocha made with a spicy Mexican chocolate, and stay for the baked goods. (Spicy pumpkin bread, anyone?) When you need a cozy place to kick your feet up for a while, though, try Konditorei. It’s an Austrian-inspired coffee and breakfast house with a gigantic fireplace and Old World hot cocoa -- meaning it’s made with steamed milk and dark chocolate, so it’s practically dessert. 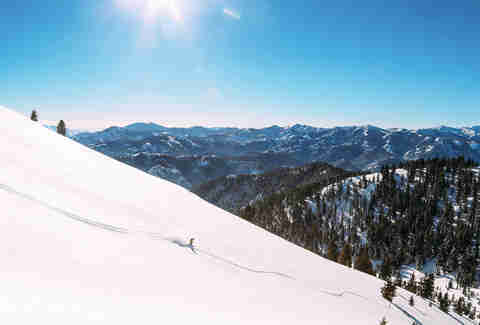 Sun Valley is considered “America’s First Destination Ski Resort” -- so you better spend some times on the slopes while you’re there. You can peep the world’s first ever chairlift on Ruud Mountain (sadly defunct now but still an impressive piece of history). If you’re a beginner, Dollar Mountain is the place to get your start, because it’s practically treeless. (So even if you’re clumsy, you’ll rock it after a few lessons.) For more advanced skiers, Bald Mountain is an Olympic training site -- so if you’re trying to humblebrag to your friends, this is the route to take...assuming you have the skills to tackle it. Even supremely advanced daredevils will find a challenge at the Sawtooth Mountains, which comprise one of the best spots on earth for backcountry skiing. If you have to look up what it is, you're not ready to do it. In fact, even if you know what it is, you're still probably not ready to do it. Experts only, please. To take things to another kind of extreme, try helicopter skiing. 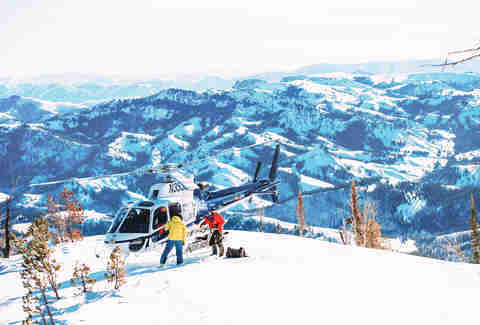 Skiing from a chopper began here, and Sun Valley Heli Ski runs guided tours through three area mountain ranges. And yes, we fully guarantee you’ll feel like James Bond when you drop out of the chopper.